The first time I put my daughter’s hair in a ponytail, my son, who was 3 at the time, asked if I would put his hair in a ponytail too. I said yes, and I’ll never forget their reactions: my two children giggled uncontrollably as they touched their hair and looked at each other’s hair. It was one of those magical, unexpected parenting moments. This seemingly small action set me and my husband on an intentional path to make space for our kids to explore toys, clothing and media outside of the constraints of traditional gender norms. We never say anything is for boys or for girls and the fluidity within their play, what they wear and what they watch is evident. Letting them self-express and play how they want has admittedly always been easier when we’re inside our house versus outside our house. We’ve made parenting mistakes, like when we didn’t buy our son a pair of pink shoes or when we wavered over whether to let him dress as Elsa for Halloween. These mistakes were followed by honest conversations and my husband and I realized what was giving us pause was fear. We were scared about how people would react to our son and we were scared he would be negatively impacted. Ultimately, we agreed we could not let our fears hold our children back. We agreed we would always support their choices in self-expression moving forward and we would support them through whatever experiences arose based on those choices. Last week, my son asked me to do his hair after a long hiatus from wearing barrettes or ponytails. He had a specific vision in mind: he wanted to look like a peacock, with three pony tails. He was thrilled with the end result and skipped off happily to school. It hurt me to hear he had been teased, but I was relieved he still seemed to feel positively about his hair even after a not so great day at school. I told him how much I loved him and how I loved his hair. I told him I was proud of him and that it was super cool to be different. We moved on with our day. This weekend my son asked my husband to put his hair up like a peacock again. When my son looked in the mirror, he said, “no, take it out. I don’t want anyone to call me a girl.” My husband tried to encourage our son to wear his hair however he wanted, and even put his own hair in a ponytail to try to make him feel comfortable. No dice. Our son remained resolute in his decision to go ponytail free because he was scared he’d be called a girl. That night, I climbed into bed with my son as he got ready to go to sleep. We lay face to face and snuggled under his covers. “Why do you think people would think you’re a girl?” I wondered. “Hmmmm. That sounds hard. What do you think? 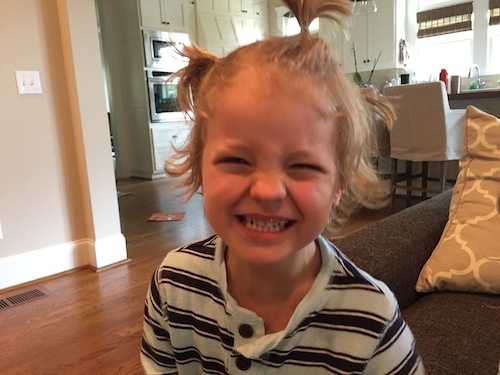 Do you think ponytails are just for girls?” I asked. We laid there silent for a few moments. “What would you do if you heard someone being called names or being teased?” I asked him. “I’d go up and say ‘that’s not very nice! '” he replied. 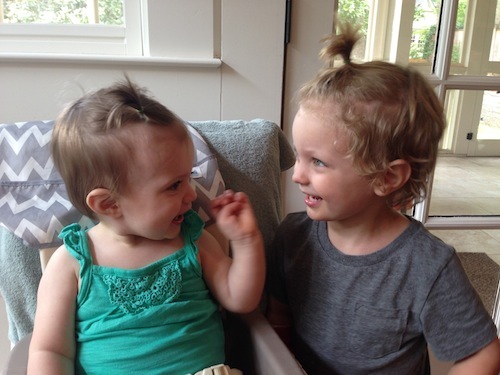 The conversation ended there and our son hasn’t asked to wear his hair in ponytails since. It’s only been a few days, but it’s weighed heavy on my mind. It feels important to recognize that my son does not appear to be gender non-conforming based on previous conversations we’ve had about gender and his gender identity. Instead, I believe he reflects what’s possible when parents let their kids explore without being so rigid around gender norms. I am also in no way trying to compare this experience to the countless acts of hate that have happened and continue to happen to adults and children in marginalized populations nation wide thanks in large part to the “Trump effect.” I share our story because it’s fresh in my mind, it was the first real hurt my son has experienced and as a parent, it hammers home the difficulty in raising compassionate, expansive kids. There are many future conversations I need to have with my son to reinforce what we spoke about this weekend. It is so important that I stay proactive versus reactive and that I teach my kids to stand up for themselves and for others when they hear hurtful language. Bullying is an age old problem in our society, to be sure, but now more than ever, with a bully-in-chief coming into office, it feels mission critical to help my children recognize differences, celebrate differences and defend those who are deemed different by mainstream society. I need help, y’all. I need help figuring out how to be the parent I want to be for my kids and for your kids. Raising Race Conscious Children helps me. We Need Diverse Books helps me. Embrace Race helps me. Raising an Advocate helps me. Showing Up For Racial Justice Families helps me. My Reflection Matters helps me. Raising My Rainbow helps me. The Mighty helps me. The indepedent book store, Charis Books & More in Atlanta, GA helps me select wonderful books to add to our children’s collection. Who is helping you? Please share any and all resources you’ve got below.